“But more are starting to hire corporate professionals at the management level too, to help grow their businesses” (More Social Enterprises Hiring Top Talent, Priscilla Goy). How many social enterprises have been able to attract talent from the private (or public) sector in the past few years, and to what extent have entrepreneurs been expanding their recruitment efforts? The observation that more corporate professionals at the management level are joining social enterprises is encouraging, because it is indeed “important for mature social enterprises – whose needs differ from start-ups – to have skilled leadership to help take the business to greater heights and make a larger social impact” (ST, Dec. 20). Naysayers may be eager to criticise these social enterprises for taking a more pragmatic approach and perhaps as a result become distracted from their social mission, yet they forget the importance of balancing both economic and social value. After all without a viable business model or quality employees, any reference to social outcomes in these companies is meaningless. But a few high-profile hires does not a trend make. 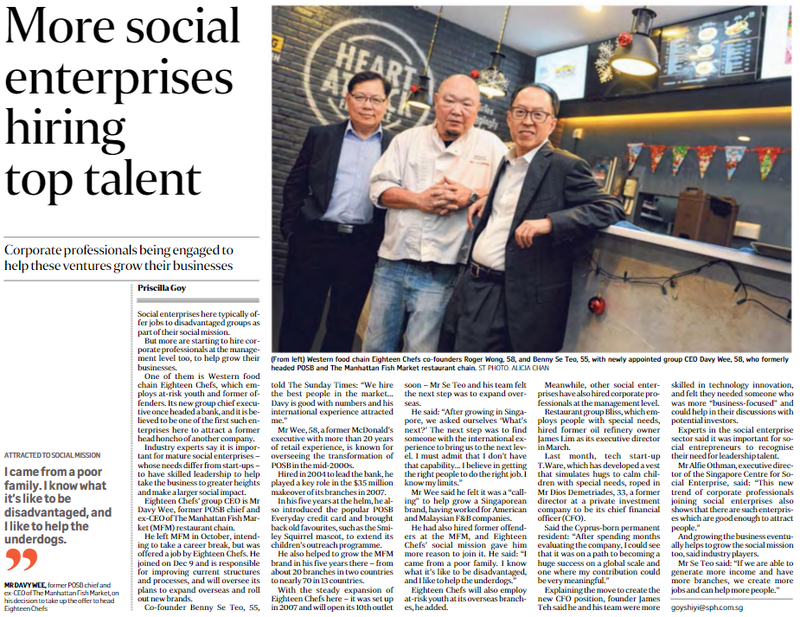 Executive director Alfie Othman of the Singapore Centre for Social Enterprise said, “This new trend of corporate professionals joining social enterprises also shows that there are such enterprises which are good enough to attract people”. Few details – however – beyond the examples of Eighteen Chefs, restaurant group Bliss, and tech start-up T.Ware provided in the article, were provided. In this vein the notion of a “trend” has to be qualified further, through research for instance. Questions therefore follow. How many social enterprises have been able to attract talent from the private (or public) sector in the past few years, and to what extent have entrepreneurs been expanding their recruitment efforts? Are they able to match the benefits or remuneration offered by the bigger corporations, or did they have to appeal through other propositions? And in the first place, how many of these companies can afford to engage corporate professionals at the management level? Even if they do join the social enterprises, do they stay for a sustainable period of time, and have their contributions been substantial? These are broader considerations for the social ventures, since human resource management is critical for their long-term success. More often than not, nonetheless, social enterprises – especially in the beginning, when finances are tight or when revenue streams are far and few between – tend to under-invest in this regard, with the further assumption that their subordinates are necessarily willing to make sacrifices. Studies can help to shed light on how the smaller start-ups in this sector recruit, retain, advance, and manage their employees, and eventually devise strategies to help them organise manpower as well as grow their organisations.